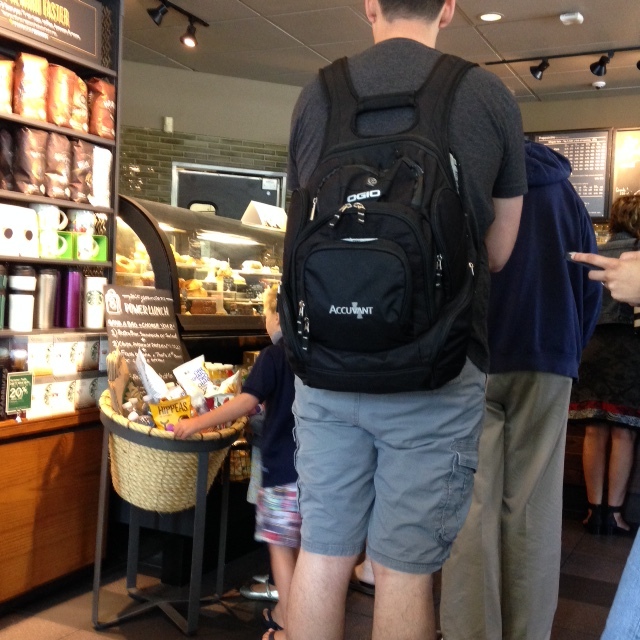 A friend and I meet often at a Starbucks in an office park and enjoy the parade of office and tech workers coming in for their morning coffee break. We first revel in the fact that they’re working and we’re not and then turn to examining their work clothes. We check out the six-inch heels on the women and are thankful we’re not wearing them. Beyond that, there is little uniformity: slacks, mini-skirts, long skirts, dresses, tunics, jeans. Styles include high collars and no cleavage, low-cut and lots of cleavage, loose, and tight. Anything goes. Then we move to the uniforms of the men: shorts and t-shirts or jeans and t-shirts. Oh yeah, and athletic shoes. Backpacks are the most common accessory. Thinking about today’s work clothes took me down memory lane. When I was a university student, women could only wear skirts or dresses. My second job after graduating was in a community college, where again we were not allowed to wear pants. A few of us “rebels” complained to our boss and said we would like to propose a new dress code, one that would allow for certain tasteful trousers. He told us to form a committee and develop a proposal. About the same time, Yves Saint Laurent was designing the first pantsuit and the idea caught on fast in the ready-to-wear world. Our committee went through catalogs and magazines and cut out samples we thought the boss would accept, pasted them on poster board and presented them to him. After he approved, we shared our pictures with the rest of the staff. I’m confident that what Laurent designed was not the pantsuit our committee came up with. Most of the ones on the market were one color, made from cheap material, and without any redeeming flourishes. I remember proudly wearing my first outfit that passed muster with our boss: a maroon polyester pantsuit. The pants were baggy by the end of the workday, but wearing pants represented victory. Now, the thought of going through what we did to be able to wear pants in the office makes me cringe. But I researched the issue and found that our experiences were not unique. We argued for change and were successful in the 70’s, but “until 1993 women were not permitted to wear pantsuits (or pants of any kind) on the United States Senate floor.” I wonder if they had to form a committee and cut out clothing ads, then plead to their colleagues for permission. Or was the Supreme Court the final arbiter? This entry was posted in aging, current events/themes, personal reflections and tagged dress codes, office dress, pantsuits, women's rights. Bookmark the permalink. I was part of a female teacher rebellion in 1971 in Connecticut – Ledyard Middle School to be precise. We did not form a committee or ask permission. Our group agreed to all wear pantsuits on the same day. There were about ten of us. It was an era of womens lib and radical protest and teachers were not inmune. The pantsuits,you describe were exactly the same ones we wore, horrible polyester materials with dubious colors of chocolate brown, powder blue, lime green and firestation red. But we were making a statement! The rebellion went off without a hitch with just a few snarky comments from the male principal. Love it. I knew women my age could relate. As I believe you and I discussed recently, I had the same experience with my school district including forming a committee, posters and all, to persuade the powers that be that we should be allowed to wear pants. Perhaps the men just didn’t want to give up looking at all our beautiful, long legs. To think I wore 4″ heels while teaching 4th graders!! I even taught PE with them on! And I remember when the first female teacher dared to wear pants to teach in. We envied her but she looked great in them and it allowed her a lot more flexibility to get on the floor with the children! That was 1969. A year later a few of us were wearing pants but not regularly. No jeans, though. And as I have observed when I join younger women on lunch dates, they all arrive in perky little dresses and I am the one wearing pants – we of ‘that generation’ know what it took to get into pants and we won’t be giving them up soon! My favorite memory of that period is about the dress code in a high school where I taught. It was the time when girls were beginning to wear tunics over pants but the school’s dress code did not allow girls to wear pants. So, being resourceful, the girls took off the pants and stored them in their lockers and wandered about the classrooms and halls in just the tunics which in my opinion were not adequate, but definitely got the point across. It was not long before pants were allowed. I helped organize a protest march on the school board of our town to allow girls to wear pants. This was in 1969. We were allowed to wear nice dress pants. Finally, I didn’t freeze that last winter in high school. Apparently there were lots of us rebels back then. I too, went through all of the silly seasons of pant wear. I loved jeans, and that was always my objective, but I didn’t realize my ambition until the mid 1970s. The most impractical pant trend I remember was the jumpsuit—a visit to the bathroom couldn’t be accomplished under at least 20 minutes! I remember the jumpsuit. Ugh!